We introduce a light-weight automatic method to quickly capture and recover 2.5D multi-room indoor environments scaled to real-world metric dimensions. 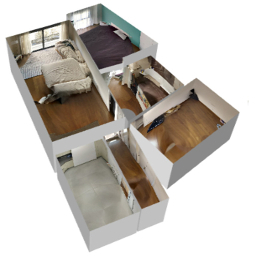 To minimize the user effort required, we capture and analyze a single omnidirectional image per room using widely available mobile devices. Through a simple tracking of the user movements between rooms, we iterate the process to map and reconstruct entire floor plans. In order to infer 3D clues with a minimal processing and without relying on the presence of texture or detail, we define a specialized spatial transform based on catadioptric theory to highlight the room's structure in a virtual projection. From this information, we define a parametric model of each room to formalize our problem as a global optimization solved by Levenberg-Marquardt iterations. The effectiveness of the method is demonstrated on several challenging real-world multi-room indoor scenes.